A woman who climbed the base of the Statue of Liberty last July 4 to protest the separation of families at the Mexican border came to her sentencing Tuesday with her face entirely covered with clear sticky tape, irritating a judge who refused to proceed until she removed it. 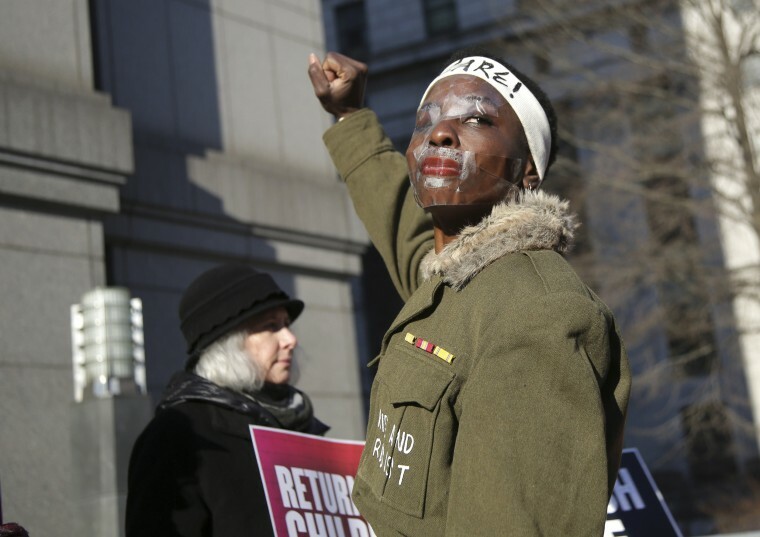 After she did so, U.S. Magistrate Judge Gabriel W. Gorenstein spared Therese Okoumou from prison for her conviction on multiple misdemeanor counts though he berated her for what he thought was a lack of concern for rescuers whose safety he said she jeopardized. As she stood before him with a white headband across her forehead scrawled with the phrase "I care!" he ordered her to perform 200 hours of community service and five years of probation, leading her attorney, Ron Kuby, to suggest the judge might be seeing a lot of them in the future. "I think there's hope" otherwise, the judge responded, saying he would be willing to shorten the probation term at a later point if Okoumou did not commit more crimes. Given a chance to speak in court, Okoumou called the case against her "a fraud against injustice," an explanation for her continuing protest and the tape she had earlier painfully pulled off her face. "I'm not a criminal," she told Gorenstein. When Gorenstein took a break from the bench before announcing the sentence, Okoumou stood and turned around to face several dozen supporters before raising her fist in the air. The gesture silenced the supporters, who raised their fists in return as everyone stood for a moment before Okoumou blew a kiss to them and turned around to await her sentence. Outside court, she was surrounded by supporters as she railed the immigration policies of the Trump administration, saying they're what prompted the Statue of Liberty protest. "We have people in cages? What was I supposed to do?" she said. "I made my point. ... Find your own conscience. Don't look up to me." As he announced his sentence, Gorenstein noted that Okoumou repeatedly ignored orders to descend from a perch at the feet of the statue that was high enough that a prosecutor said it could have seriously injured or killed her or tourists below. New York Police Department rescuers were forced to climb a rickety ladder and gird themselves like mountain climbers to safely bring her down. The judge said she tried to push down the ladder, jeopardizing rescuers. Prosecutors noted in presentencing papers that since Okoumou's arrest, she has twice climbed the Eiffel Tower in Paris, France, forcing its evacuation, and has climbed onto the roof of an Austin, Texas, building, leading to another arrest in which charges are pending. The Texas climb led to her being subjected to electronic monitoring in New York, though Gorenstein ordered the removal of the device Tuesday. Kuby said Gorenstein was overestimating the danger to rescuers posed by his client's statue climb. The lawyer called them the most elite rescuers "on the planet."